There is an obvious conundrum in pricing dating apps. In most pricing strategies, you want to retain customers and upsell over time. You are building a relationship. For dating apps, your user is building a relationship with someone else and, the moment they do, you are dropped. This means that upselling and increasing ARPU is something dating apps have to do quickly. To do that, they have to completely understand their users. 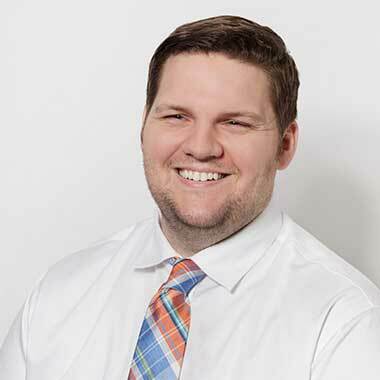 In this episode of Pricing Page Teardown, Price Intelligently CEO Patrick Campbell and GM Peter Zotto show how two of the biggest apps are doing exactly that. Tinder is the market leader. Tinder users are making more than 26 million matches per day, pushing the company's valuation to $3 billion. Bumble might not have such high numbers, but it is already valued at $1 billion on the back of its push to make the dating app a better experience for all involved, especially women. “No matter what Tinder’s market research may have shown about the younger users’ relative income and willingness to pay for the service, as a group, as compared to the older cohort, some individuals will not fit the mold. Some older consumers will be “more budget constrained” and less willing to pay than some in the younger group. We conclude the discriminatory pricing model, as alleged, violates the Unruh Act and the UCL to the extent it employs an arbitrary, class-based, generalization about older users’ incomes as a basis for charging them more than younger users. Jokes aside, with one decision the appellate court destroyed Tinder's best monetization opportunity and their ability to match their value as a service to their customer's willingness to pay. Age is a great way to segment pricing on dating apps. The willingness to pay in the upper age bands is greater than 2X that at the lowest ages. At the upper bound of the upper age bracket, a dating app could bring in revenue of over $400/year per user. Men have 2X higher willingness to pay than women on dating apps. The higher bound of the willingness to pay for women is about the same as the median willingness to pay for men. Dating apps can be more of a hassle than help for women, pushing their willingness to pay down. 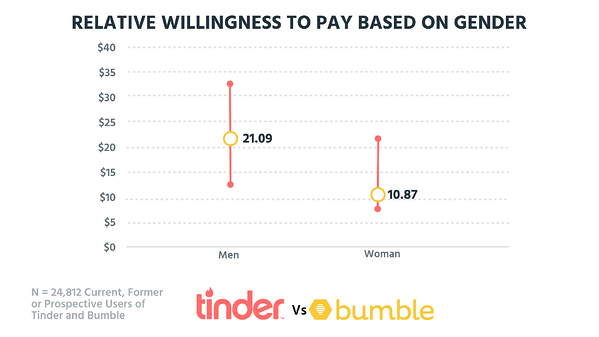 To increase willingness to pay in women, dating apps have to create features that are more appealing to women, such as Bumble's feature that only allows women to initiate any contact. The median willingness to pay in a metro area is again almost 2X that in rural areas. Dating apps were made for cities. They require a significant number of users to work. In cities, daters know that there could be someone in the next neighborhood who is perfect for them, they just need to find them in all the noise. Paying more, even if it means swiping left on hundreds of people, is worth it if you know you can swipe right eventually. The same factors that work for dating apps in cities are restricting the willingness to pay out in the country. There isn't the network effect. Users might already know most of the people in their town. That or the catchment area has to be so large that grabbing coffee with a match might mean a 150-mile round-trip. Putting this all together shows who the extremely high-value user for dating apps is: an over-30, city-dwelling man. At the other end of the spectrum, a young, country girl is not going to increase ARPU for Tinder. The young, country girl would see pricing of < $10/month. The older, city man would see pricing of > $20/month. Both users would get a product they want at a price they want. After California, this avenue of pricing to increase ARPU is now off-limits. Tinder focuses on quantity. 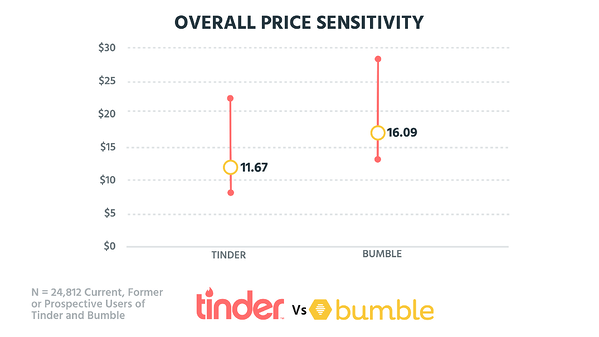 There are approximately 50 million users on Tinder, which is more than twice the number of users who are on Bumble. On Tinder, noise is a feature not a bug. Bumble focuses on quality. Particularly for women, Bumble produces a better experience and the potential for higher quality matches and conversations. 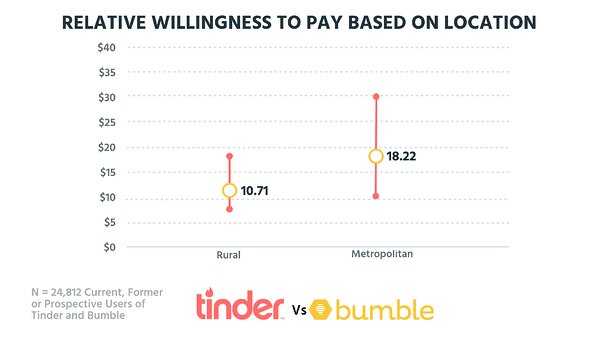 The willingness to pay for Tinder is $11.67, whereas the median willingness to pay for Bumble is $16.09. 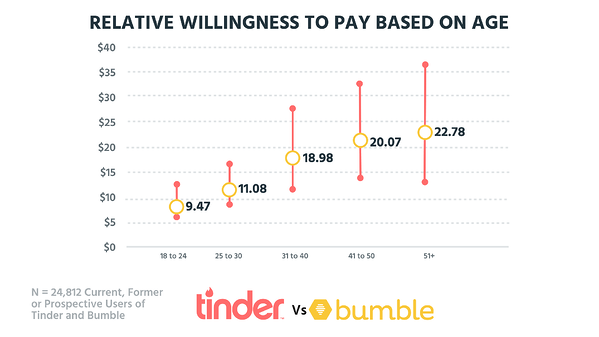 People are willing to pay about one-third more for the better experience found on Bumble. But from our feature preference analysis, we can see that there are more opportunities for each company to increase revenue from their features. In Trash Land is the ability to hide ads. Removing ads is a consistent feature of moving from a free to a paid version of an app. Dating app users simply don't care. Have them or don't, users will continue with the app no matter what. The Table Stakes are swipe rewinds. This is interesting as most dating apps will add this as a premium feature. Our research shows that users expect this as part of the core package. This could be because frustration increases if you swipe left or right and regret your choice. Dating apps should make sure they keep their users happy. Most features are available as Differentiators for dating apps. 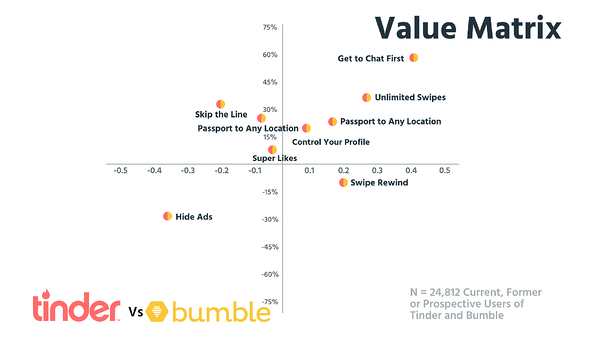 The premium tier for Tinder and Bumble could include getting to chat with potential suitors, unlimited swipes, and passport (using the app to set up dates in locations you are about to visit). Add-ons could be super-likes (showing you are really interested in someone) and skipping the line (showing your profile first in the feed of others). This is one avenue for expansion revenue that these companies need to monetize users quickly. Both Patrick and Peter would use Bumble, and both would happily put their money there too. Just as in SaaS, the future is about the experience and the relationship. Bumble already understands that and is already bringing that understanding to a world beyond dating. With that, they can start to hit the numbers that Tinder is associated with and potentially grow into a relationship engine. Want your own pricing page teardown?